Rossford Dome is now open! Soccer Centre league play is fun and exciting and available for all age groups. Sign ups are now underway. Get your team together and see if your team has what it takes to succeed in League Play. Improve ball control, passing, dribbling, and shooting. The skills taught during Footskill classes enable players to improve their performance level as well as gain the confidence they need to succeed. We offer several competitive tournaments each year. Does your team have what it takes to compete for nationals? Weak teams need not apply. Another great season is about to kick-off. We offer opportunities for children from the ages of 2 all the way through Adult Leagues. There will be competitive and recreational leagues, as well as instructional classes, tournaments, and soccer camps. Working within the soccer community, competition is a top focus as we had over 700 teams come through our doors last year. With the top clubs in the area playing at our facility, the competition level is very high, however clubs are not the only teams that play here. We also see numerous recreational teams because we are able to place them into equal divisions. Here at Soccer Centre we do all we can to support our local soccer community. We understand that you have a choice of facilities to play within the Toledo area, and we will do whatever it takes to accommodate your needs. This year we will continue to beat any competitor's team price in order to keep the competition level high and provide the best soccer experience possible. We hope to see you at our facility, and never hesitate to stop in the office and give suggestions on how we can make your soccer experience more enjoyable. 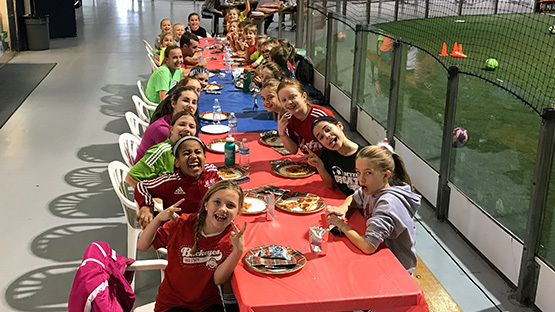 See why so many people love Maumee Soccer Centre. The Leader in Competion.